Nom botanique Ocimum basilicum L.
Basil exotic essential oil (organic) (2 ml) + Ginger essential oil (organic) (2 ml) + Sweet Marjoram essential oil (organic) (2 ml) + Maritime Pine essential oil (2 ml) + Sweet almond oil (organic) (4 ml) . Massage your lower back and abdomen 3x/day for 7 days. 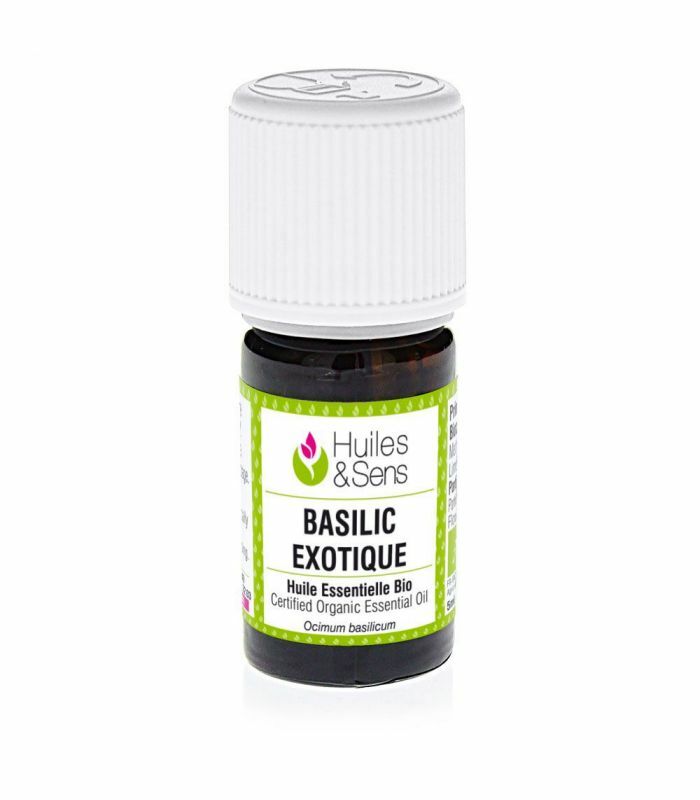 Basil exotic essential oil (organic) (2 drops) + (2 drops) + Clove Bud essential oil (organic) (2 drops) + Winter Savory essential oil (organic) (2 drops) + thyme thujanol essential oil (2 drops) + Baobab Oil (organic) (10 drops) . Massage the lower back as well as the lower abdomen 3x/day with a few drops of this mixture. Basil exotic essential oil (organic) (2 ml) + Rosemary verbenone essential oil (organic) (2 ml) + Peppermint essential oil (organic) (2 ml) + Lemon essential oil (organic) (2 ml) + Nigella Oil (organic) (4 ml) . Mix ingredients and divide in 4 doses to be taken every 15 minutes for one hour. Basil exotic essential oil (organic) (1 drop) + (1 drop) + Baobab Oil (organic) (10 drops) + Clove Bud essential oil (organic) (1 drop) + thyme linalol essential oil (organic) (1 drop) + Winter Savory essential oil (organic) (1 drop) . Mix all these ingredients and massage the back and lower abdomen, morning, noon and evening until improvement of symptoms. Basil exotic essential oil (organic) (0.5 ml) + thyme linalol essential oil (organic) (0.5 ml) + Rosewood essential oil (organic) (0.5 ml) + Pine needle essential oil (organic) (0.5 ml) + Black spruce essential oil (organic) (0.5 ml) + Arnica macerate (organic) (5 ml) . This preparation is used in massage, daily, in the morning and in the evening. Massage the solar plexus and the soles of the feet. Duration: 8 to 10 days. Basil exotic essential oil (organic) (1 ml) + (1 ml) + thyme thymol essential oil (organic) (1 ml) + Sage essential oil (organic) (1 ml) + Peppermint essential oil (organic) (1 ml) + Clove Bud essential oil (organic) (1 ml) + (1 bag) . Mix the essential oils in a 10 ml bottle. Pour a drop of synergy on a tablet and swallow (one in the morning one in the evening). Duration: 3 to 4 weeks. Basil exotic essential oil (organic) (1 ml) + Peppermint essential oil (organic) (1 ml) + Lemon essential oil (organic) (1 ml) + Pine needle essential oil (organic) (1 ml) . Put together this synergy of essential oils for your diffuser. Diffuse for a few minutes (office, living room, etc. ), every 2 to 3 hours. Basil exotic essential oil (organic) (1 ml) + Roman chamomile essential oil (organic) (1 ml) + Lavandin super essential oil (organic) (1 ml) + Peppermint essential oil (organic) (1 ml) + wintergreen fragr. 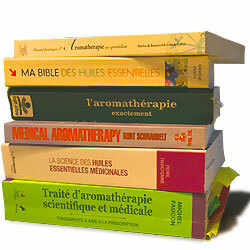 essential oil (organic) (1 ml) + Clove Bud essential oil (organic) (1 ml) + Jojoba Oil (organic) (50 ml) . This preparation brings a synergy of essential oils to soothe effective headache. Apply a few drops in circular massages at the temples and neck. Basil exotic essential oil (organic) (2 ml) + Coriander essential oil (organic) (2 ml) + Peppermint essential oil (organic) (2 ml) + Olive oil (organic) (5 ml) . Mix essential oils in olive oil and take this mixture (2 drops) during meals until improvement. Basil exotic essential oil (organic) (1 ml) + Rosewood essential oil (organic) (1 ml) + thyme linalol essential oil (organic) (1 ml) + Sweet almond oil (organic) (5 ml) + Pine needle essential oil (organic) (1 ml) + Black spruce essential oil (organic) (1 ml) . Massage the spine 3x/day with a few drops of this mixture for ten days. Basil exotic essential oil (organic) (3 drops) + bergamot essential oil (organic) (3 drops) + Perfume free Hair & Body Liquid Soap (1 spoon soup) + Mandarin green essential oil (3 drops) + Sweet orange essential oil (organic) (3 drops) . Dilute essential oils in the neutral base and pour in the hot tub. Relax for about 20 minutes in the bath. Come out of the bath without rinsing and go to bed. Take a bath every day for 15 days. 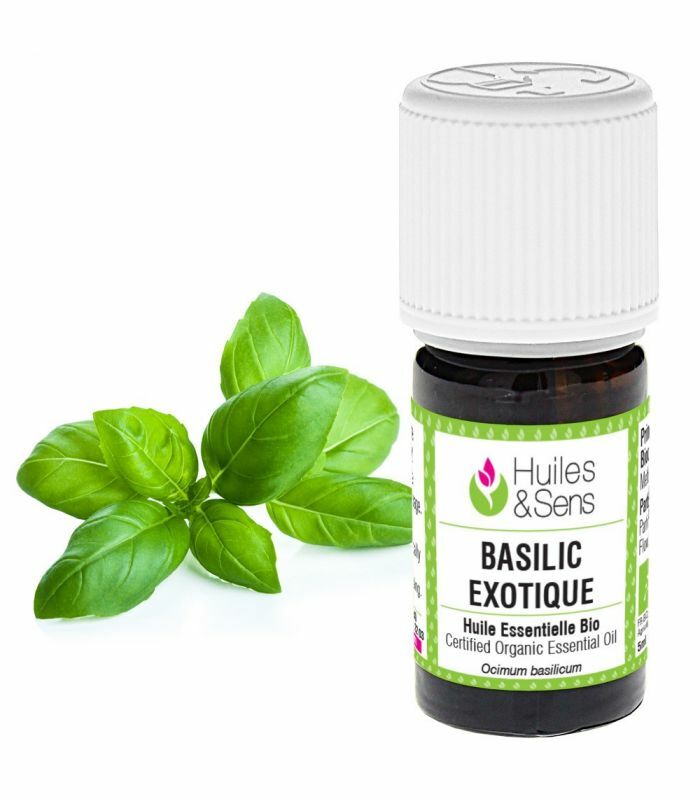 Basil exotic essential oil (organic) (2 ml) + Coriander essential oil (organic) (2 ml) + Caraway (organic) (1 ml) + Peppermint essential oil (organic) (2 ml) + Calophyllum Oil (organic) (3 ml) . Mix all ingredients and pour them into an amber glass bottle. Massage your stomach and lower abdomen 3x/day until improvement. Basil exotic essential oil (organic) (2 ml) + Lemon essential oil (organic) (2 ml) + Lemon balm essential oil organic (2 ml) + Sweet almond oil (organic) (5 ml) . Mix these ingredients in an amber opaque bottle and massage the plexus with 3 drops in case of nausea. You can also directly inhale from the bottle. Basil exotic essential oil (organic) (2 drops) + Lemon essential oil (organic) (2 drops) + Lemon balm essential oil organic (2 drops) + Peppermint essential oil (organic) (2 drops) . Pour all oils in a bottle. Inhale when you do not feel well. You can also massage the chest with this mixture (no more than 2 to 3 drops). Basil exotic essential oil (organic) (3 drops) + thyme thujanol essential oil (3 drops) + Ledum essential oil (organic) (3 drops) . Mix for 3 massages, one in the morning, one at noon and one at bedtime. Massage the area of the liver with this preparation.